So I don't really talk about this on my little bloggio, but I knit! Not all the time, and I very rarely actually finish something that I start knitting (which is a theme of my life basically)..... but I do knit. A while back, I posted about a baby hat I knitted for one of my second graders' families. Toward the end of the year, one of my first graders came to school and proclaimed that her mom was having a baby. After confirming this news, I decided to work on a blanket for el bebé! I just finished yesterday evening. I feel like I am going to make 894987545 more of these blankets because my facebook has exploded with expectant moms!! Look at you! You go girl! That is beautiful! 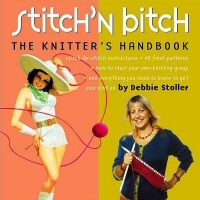 (I love the name of the book...hehe) I've never knitted anything, but I do like to crochet...and I very rarely finish anything I start! WOW!! That is beautiful! I am sure that they will love it!